Advertised as a “fuel cell vehicle,” there’s currently no other vehicle on the market quite like the 2017 Toyota Mirai — no hybrid, plug-in hybrid, or electric vehicle comes close. That’s because the Toyota Mirai is powered by a special kind of hydrogen fuel that utilizes a combination of the fuel cells and air filtered through the grille in order to generate electricity. The only waste product during this exchange is water, making the Toyota Mirai one of the eco-friendliest options out there. The fuel is safe during collisions, too. Safety was prioritized when engineering the Toyota Mirai, resulting in leak-proof tanks and sensors that stop the flow of hydrogen during accidents; if any hydrogen does manage to leak, it safely disperses into the atmosphere. There’s also a ton of advanced safety tech built into the Mirai, such as the innovative Pre-Collision System and Safety Connect emergency assistance. Aside from its unique drivetrain that’s easier and cleaner than ever to own, refuel, and drive, the Toyota Mirai is also filled with value; its sleek design gives it a futuristic edge, and the interior is made to be comfortable, roomy, and high-tech. You don’t have to compromise a thing inside the 2017 Toyota Mirai fuel cell vehicle. 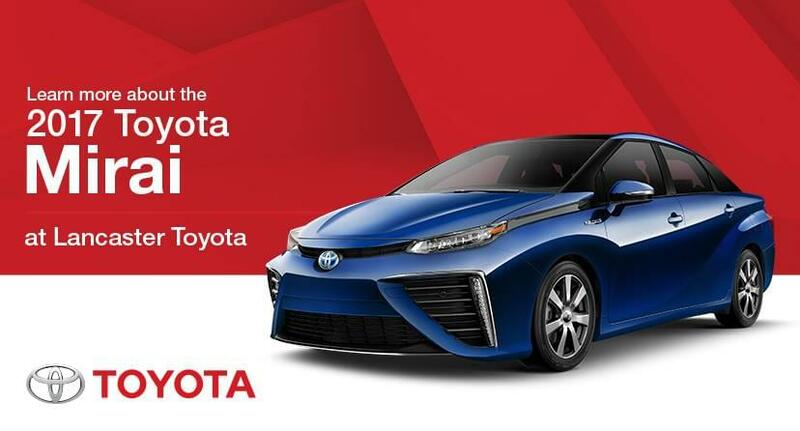 While the 2017 Toyota Mirai is only available at a few West Coast dealerships, we here at Lancaster Toyota have plenty of eco-friendly, fuel-efficient vehicles to choose from! See our complete line of Prius models today, or check out a hybrid version of your favorite Toyota!